Rupert Hirst's amazing resin-encased headphone amplifier is a work of art and shows a novel (to me) way of building a circuit without any mounting board. His buildlog shares many great details, especially about the casting process. Mats Engstrom has shown a few 3D circuits lately too: a Little Wire programmer circuit built boardless with SMD components (at left) and encased in resin, and a Freeformed Nixie Tube clock with a beautiful radial design inside a box-like frame. Print out this PCB pattern. I used a flux of the strong acidity for the steel wire soldering. His "One Chip Arduino" has no board either, stressing economy. 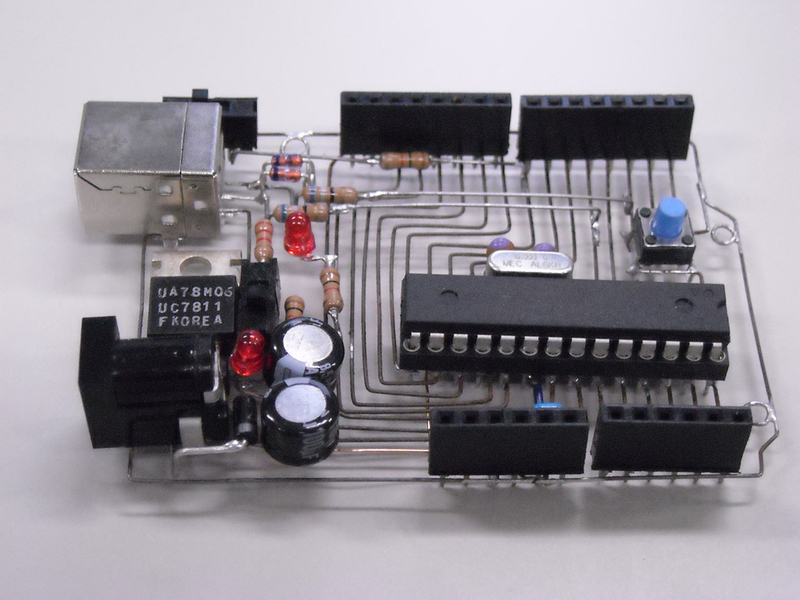 I find more examples the more I look, like this 3D alarm clock, video about using a CD as a circuit board, and Make: uses the tag "freeform" for freeform circuit layouts on its blog. 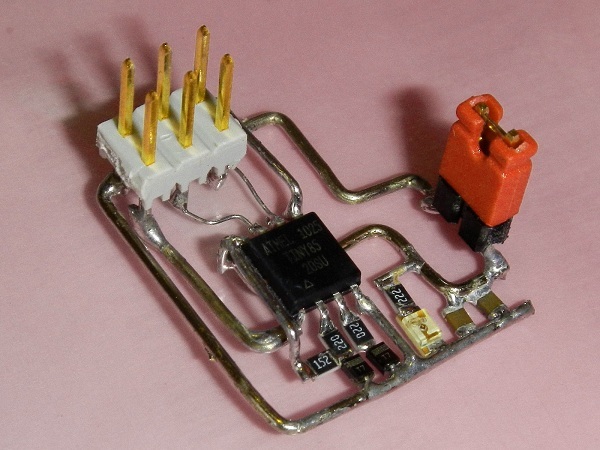 These inspired me to make one of my own, which turned out to be a faster, easier, cleaner way to make a simple 1-off circuit than home etching or point-to-point soldering, if the process is refined. This is a Flickr badge showing public items from Flickr tagged with Arduino. Make your own badge here. Handmade/Homemade Board: "My Arduino III"